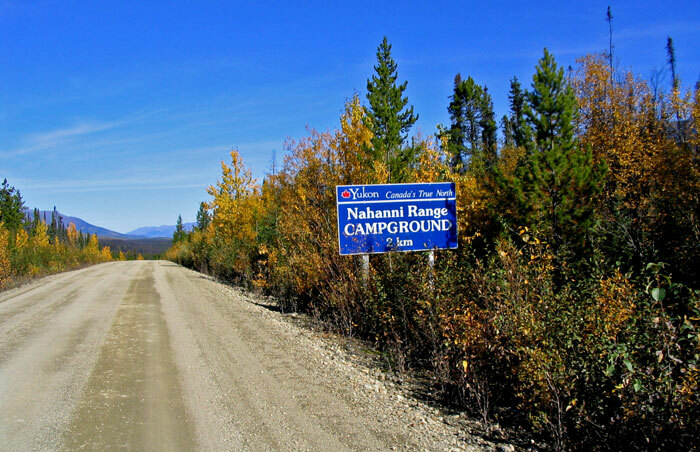 The start of the Nahanni Range Road is only 25 km north of the Simpson Lake Yukon gov't campground, which is a nice place to stay. This sign at the start of the road was an accurate sign, other than the typo on it. 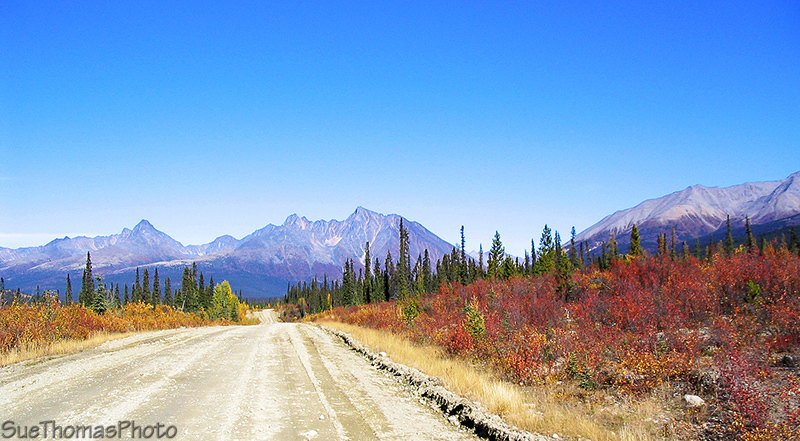 Today, blue skies and good gravel road greeted the truck. Clear blue skies are amazing in the north in the autumn. 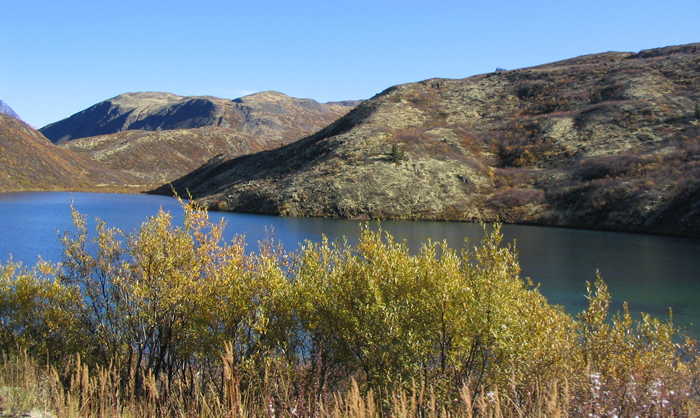 The first 80 km provided reasonable road conditions and nice scenery. We didn't know yet that the best was the next 50 km ahead. 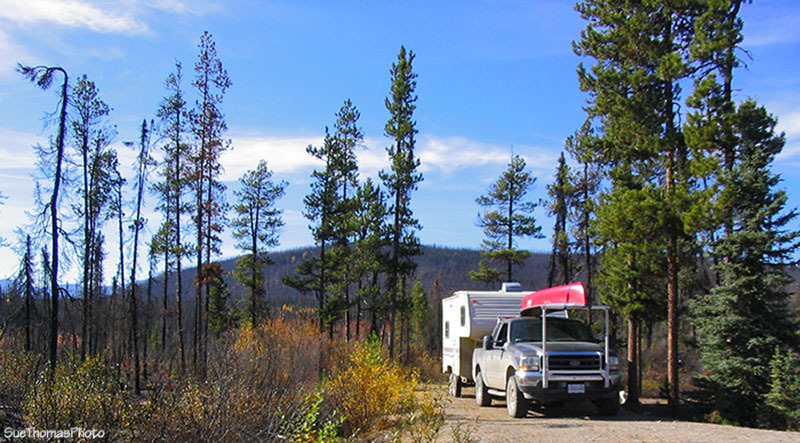 The campground was in the middle of a large forest fire that burned about five years before. Even so, it would have been a good overnight spot. It was only midday so we carried on after lunch. 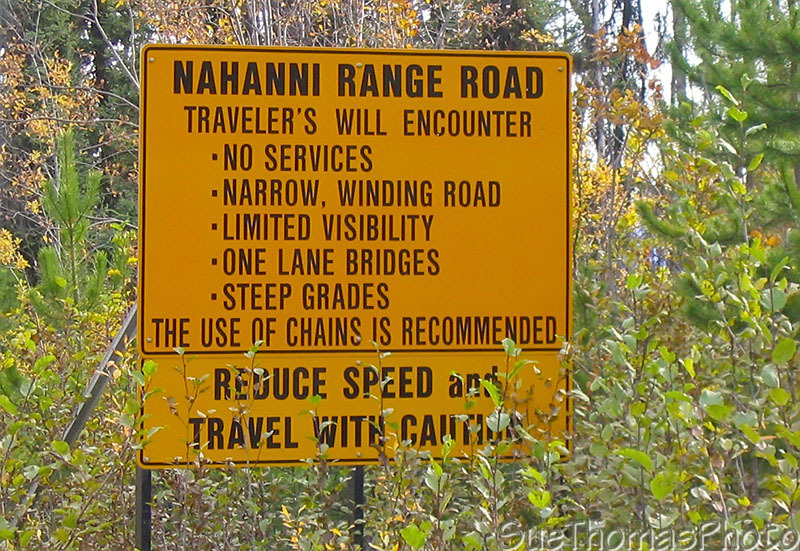 This warning at km 134 was taken seriously. 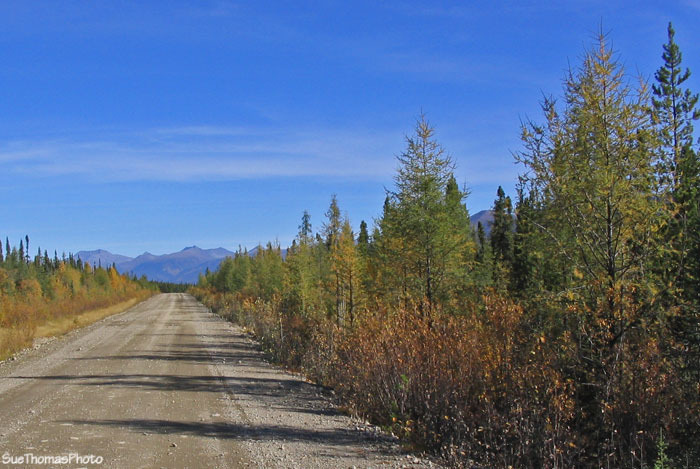 We carried on, understanding the risk of traveling on remote roads in Canada's north. We were prepared to take care of ourselves for an extended period. 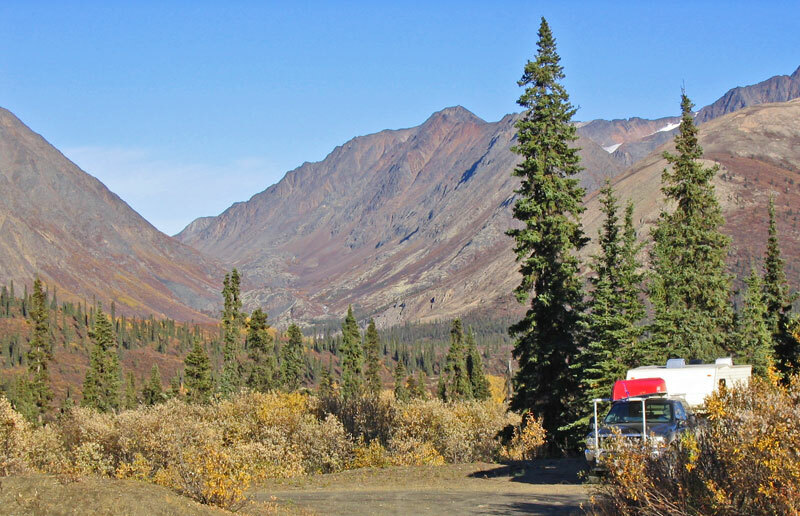 We had fuel, food & water and first aid kit, plus tools to repair the truck should something break. 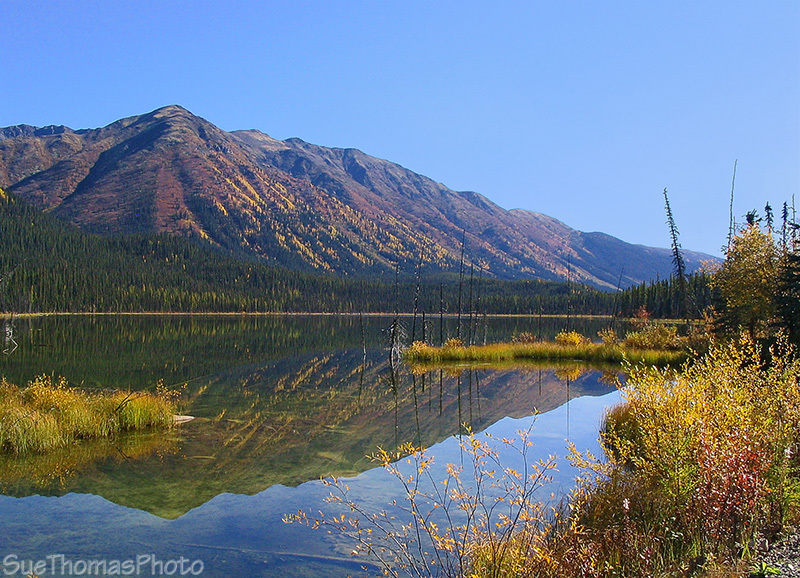 Further along, the blue skies and clear day provided perfect picture opportunities. Overall, the road was in good condition. This area had been freshly graded. 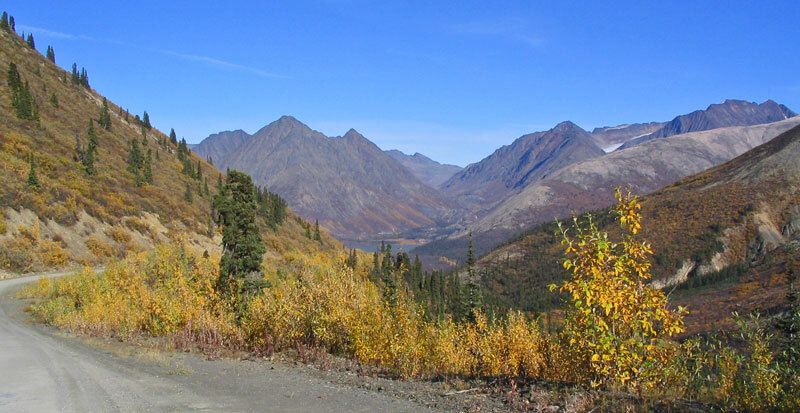 The road climbed towards the Northwest Territories. The road narrowed as it climbed. On one side was a wall and on the other side was a severe drop with no roadside barrier. Steve inched the truck along as we didn't know if there would be oncoming traffic around any of the corners. 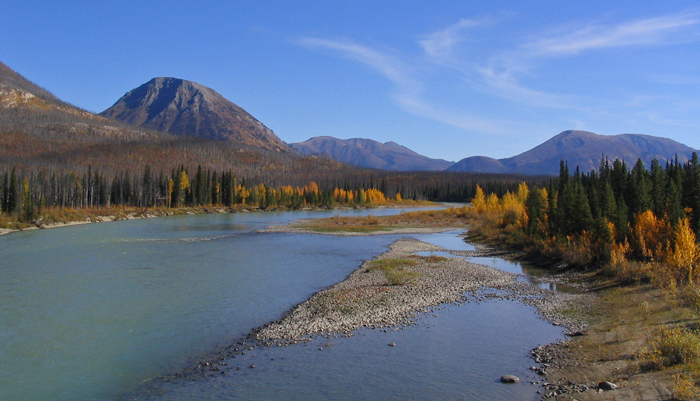 We wondered where the border between Yukon and Northwest Territories would be. A "Notice to Hunters" was the only marking. DEADEND AHEAD 300-400 FT, and KEEP RIGHT. Not sure what was ahead we crept slowly up to the edge. 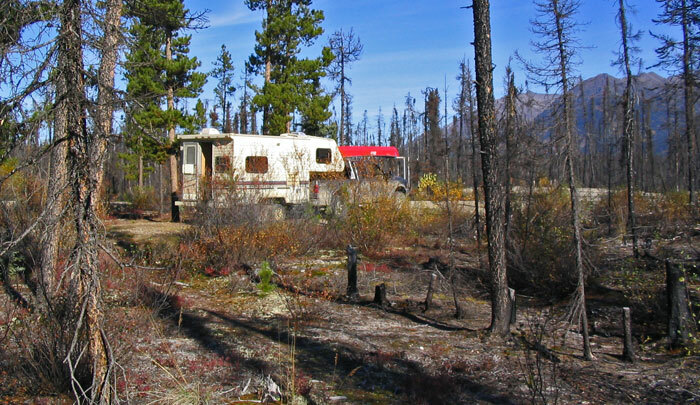 There was no place to turn around with a fifth wheel behind us! 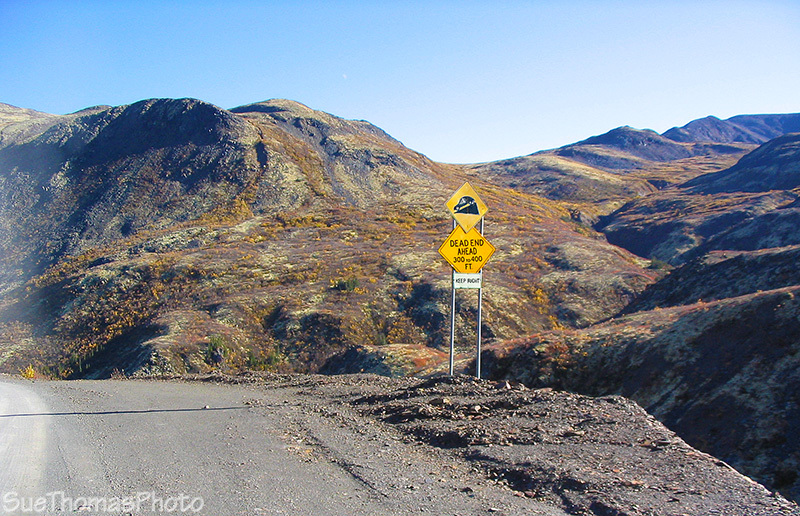 Soon we realized the sign should have said "90 degree left turn and if you miss the turn you will fall a long way over a vertical bank". Continuing along, the scenery was spectacular. Amazing colours! 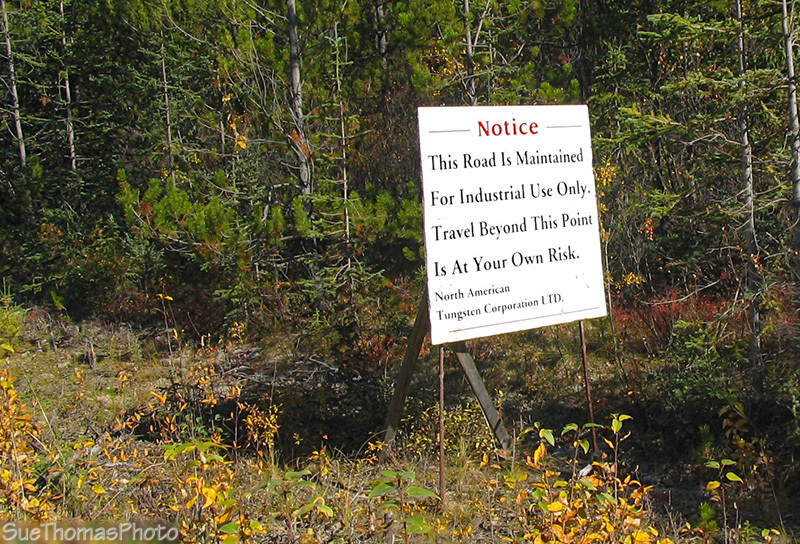 The Cantung tungsten mine is at the end of the road. 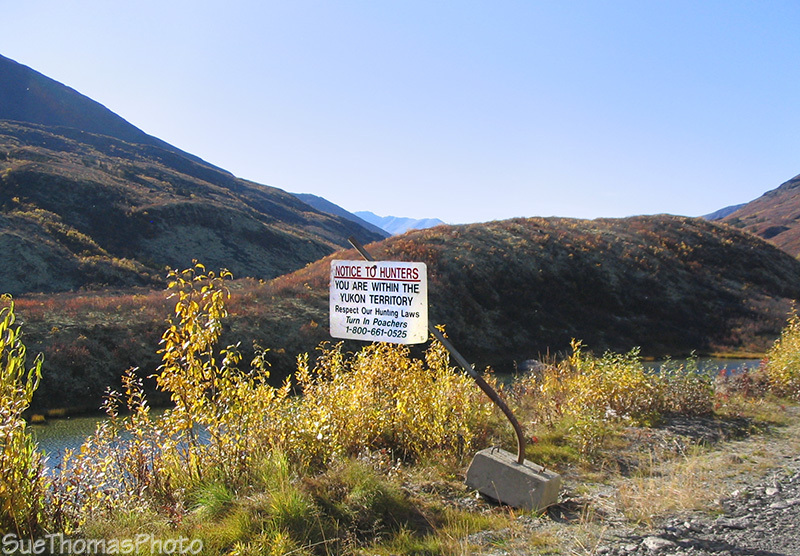 There isn't much to see other than the signs indicating, "No Trespassing". We heeded the "No Trespass" signs. 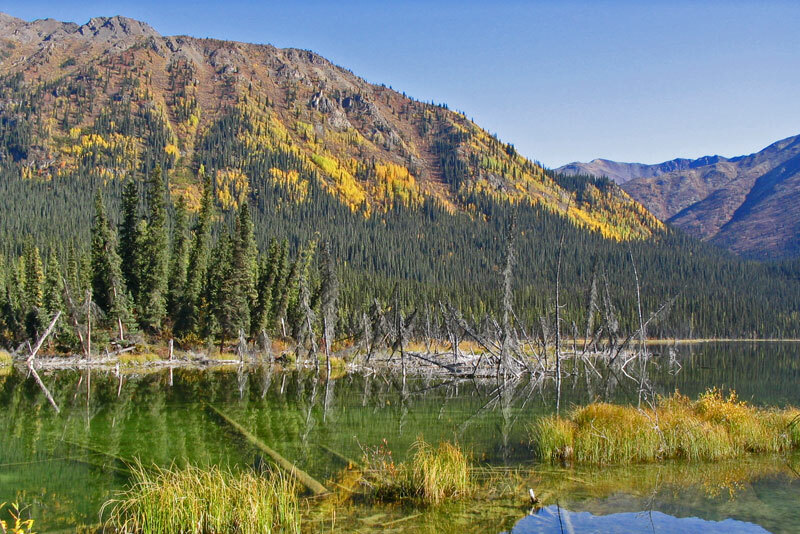 There was a fine spot to set up camp a few kilometres back. The evening was very quiet with a few planes flying overhead. 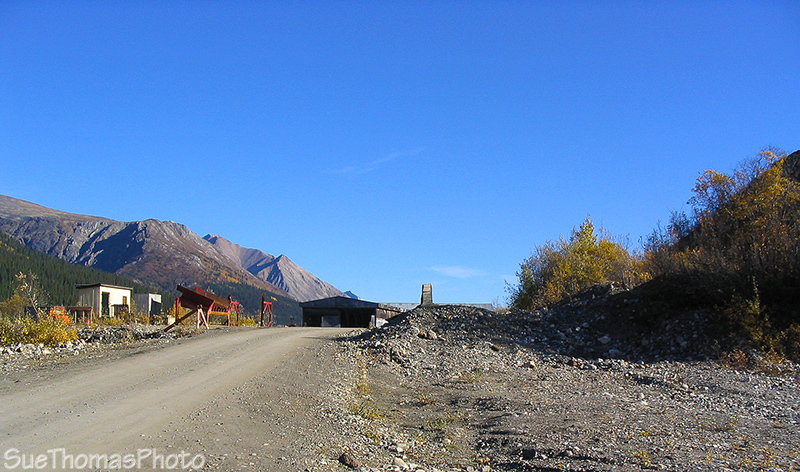 A couple of workers from the mine passed by on their way to retrieve a moose they shot the night before. 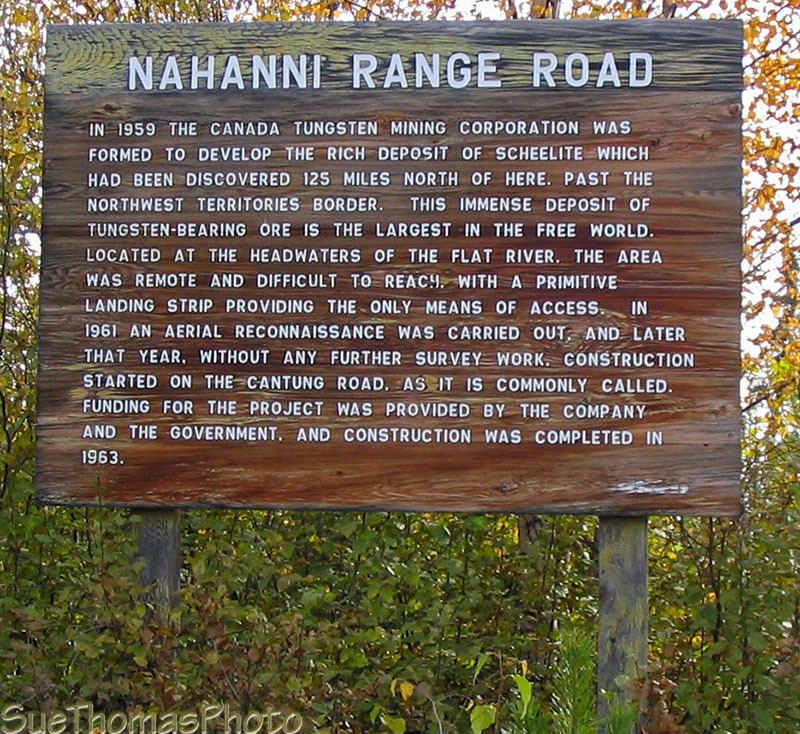 They told us the planes were flying between the Cantung mine and Mactung at Macmillan Pass (end of the North Canol Rd). They also told us not to wander too far without reflective gear as some hunters liked to shoot into this valley from the road we drove in on, They thought some of the hunters wouldn't expect to see two humans and a dog out for an evening stroll and might assume we were something else in the dusk. So they thought it best we be brightly decorated. We didn't meet anyone else that night; nor were we used for target practice.